22 D None No Power Seat 22 D is a Business Class Exit Row seat that may have extra legroom. Passengers traveling with an infant are often seated here as there are bassinets in this row. 22 G None No Power Seat 22 G is a Business Class Exit Row seat that may have extra legroom. Passengers traveling with an infant are often seated here as there are bassinets in this row. 43 A None No Power Seat 43 A has extra legroom. The proximity to the lavatory may be bothersome. This seat has an immovable armrest, slightly reducing seat width. Passengers traveling with an infant are often seated here as there are bassinets in this row. 43 B None No Power Seat 43 B has extra legroom. The proximity to the lavatory may be bothersome. This seat has an immovable armrest, slightly reducing seat width. Passengers traveling with an infant are often seated here as there are bassinets in this row. 43 C None No Power Seat 43 C has extra legroom. The proximity to the lavatory may be bothersome. This seat has an immovable armrest, slightly reducing seat width. Passengers traveling with an infant are often seated here as there are bassinets in this row. 43 H None No Power Seat 43 H has extra legroom. The proximity to the lavatory may be bothersome. This seat has an immovable armrest, slightly reducing seat width. Passengers traveling with an infant are often seated here as there are bassinets in this row. 43 J None No Power Seat 43 J has extra legroom. The proximity to the lavatory may be bothersome. This seat has an immovable armrest, slightly reducing seat width. Passengers traveling with an infant are often seated here as there are bassinets in this row. 43 K None No Power Seat 43 K has extra legroom. The proximity to the lavatory may be bothersome. This seat has an immovable armrest, slightly reducing seat width. Passengers traveling with an infant are often seated here as there are bassinets in this row. 44 C None No Power Seat 44 C is a standard Economy seat, however, this seat may feel cramped due to the curvature of the fuselage. 44 H None No Power Seat 44 H is a standard Economy seat, however, this seat may feel cramped due to the curvature of the fuselage. 45 D None No Power Seat 45 D is an Economy Class seat that has extra legroom however, other flyers tend to bump into this seat. Passengers traveling with an infant are often seated here as there are bassinets in this row. 45 E None No Power Seat 45 E is an Economy Class seat that has extra legroom however, other flyers tend to bump into this seat. Passengers traveling with an infant are often seated here as there are bassinets in this row. 45 F None No Power Seat 45 F is an Economy Class seat that has extra legroom however, other flyers tend to bump into this seat. Passengers traveling with an infant are often seated here as there are bassinets in this row. 45 G None No Power Seat 45 G is an Economy Class seat that has extra legroom however, other flyers tend to bump into this seat. Passengers traveling with an infant are often seated here as there are bassinets in this row. 50 A None No Power Seat 50 A is a standard Economy seat, however, the proximity to the galley may be bothersome. 50 B None No Power Seat 50 B is a standard Economy seat, however, the proximity to the galley may be bothersome. 50 H None No Power Seat 50 H is a standard Economy seat, however, the proximity to the galley may be bothersome. 50 J None No Power Seat 50 J is a standard Economy seat, however, the proximity to the galley may be bothersome. 50 K None No Power Seat 50 K is a standard Economy seat, however, the proximity to the galley may be bothersome. 52 A None No Power Seat 52 A has extra legroom, however the proximity to the galley may be bothersome. Passengers traveling with an infant are often seated here as there are bassinets in this row. 52 B None No Power Seat 52 B has extra legroom, however the proximity to the galley may be bothersome. Passengers traveling with an infant are often seated here as there are bassinets in this row. 52 C None No Power Seat 52 C has extra legroom, however the proximity to the galley may be bothersome. Passengers traveling with an infant are often seated here as there are bassinets in this row. 52 H None No Power Seat 52 H has extra legroom, however the proximity to the galley may be bothersome. Passengers traveling with an infant are often seated here as there are bassinets in this row. 52 J None No Power Seat 52 J has extra legroom, however the proximity to the galley may be bothersome. Passengers traveling with an infant are often seated here as there are bassinets in this row. 52 K None No Power Seat 52 K has extra legroom, however the proximity to the galley may be bothersome. Passengers traveling with an infant are often seated here as there are bassinets in this row. 54 A None No Power Seat 54 A is a standard Economy seat, however, this seat has limited under seat leg and storage room due to the presence of an entertainment equipment box. 54 D None No Power Seat 54 D is an Economy Class seat that has extra legroom. Passengers traveling with an infant are often seated here as there are bassinets in this row. 54 E None No Power Seat 54 E is an Economy Class seat that has extra legroom. Passengers traveling with an infant are often seated here as there are bassinets in this row. 54 F None No Power Seat 54 F is an Economy Class seat that has extra legroom. Passengers traveling with an infant are often seated here as there are bassinets in this row. 54 G None No Power Seat 54 G is an Economy Class seat that has extra legroom. Passengers traveling with an infant are often seated here as there are bassinets in this row. 55 A None No Power Seat 55 A is a standard Economy seat, however, this seat has limited under seat leg and storage room due to the presence of an entertainment equipment box. 6 D None No Power Seat 6 D is a Business Class seat however, the proximity to the lavatory may be bothersome. Passengers traveling with an infant are often seated here as there are bassinets in this row. 6 G None No Power Seat 6 G is a Business Class seat however, the proximity to the lavatory may be bothersome. Passengers traveling with an infant are often seated here as there are bassinets in this row. 65 B None No Power Seat 65 B has limited recline. The proximity to the lavatories may be bothersome. 65 D None No Power Seat 65 D has limited recline. The proximity to the lavatories may be bothersome. 65 E None No Power Seat 65 E has limited recline. The proximity to the lavatories may be bothersome. 65 F None No Power Seat 65 F has limited recline. The proximity to the lavatories may be bothersome. 65 G None No Power Seat 65 G has limited recline. The proximity to the lavatories may be bothersome. 65 H None No Power Seat 65 H is a standard Economy seat, however, the proximity to the lavatories may be bothersome. 66 H None No Power Seat 66 H has limited recline. The proximity to the lavatories may be bothersome. 66 J None No Power Seat 66 J has limited recline. The proximity to the lavatories may be bothersome. 66 K None No Power Seat 66 K has limited recline. The proximity to the lavatories may be bothersome. 67 B None No Power Seat 67 B has extra legroom. The proximity to the lavatories may be bothersome. 67 C None No Power Seat 67 C has extra legroom. The proximity to the lavatories may be bothersome. 67 D None No Power Seat 67 D is an Economy Class Exit Row seat that has extra legroom. The proximity to the lavatories may be bothersome. Passengers traveling with an infant are often seated here as there are bassinets in this row. 67 E None No Power Seat 67 E is an Economy Class Exit Row seat that has extra legroom. The proximity to the lavatories may be bothersome. Passengers traveling with an infant are often seated here as there are bassinets in this row. 67 F None No Power Seat 67 F is an Economy Class Exit Row seat that has extra legroom. The proximity to the lavatories may be bothersome. Passengers traveling with an infant are often seated here as there are bassinets in this row. 67 G None No Power Seat 67 G is an Economy Class Exit Row seat that has extra legroom. The proximity to the lavatories may be bothersome. Passengers traveling with an infant are often seated here as there are bassinets in this row. 67 H None No Power Seat 67 H has extra legroom. The proximity to the lavatories may be bothersome. 67 J None No Power Seat 67 J has extra legroom. The proximity to the lavatories may be bothersome. 79 A None No Power Seat 79 A is a standard Economy seat however, the proximity to the galley may be bothersome. 79 B None No Power Seat 79 B is a standard Economy seat however, the proximity to the galley may be bothersome. 79 C None No Power Seat 79 C is a standard Economy seat however, the proximity to the galley may be bothersome. 79 H None No Power Seat 79 H is a standard Economy seat however, the proximity to the galley may be bothersome. 79 J None No Power Seat 79 J is a standard Economy seat however, the proximity to the galley may be bothersome. 79 K None No Power Seat 79 K is a standard Economy seat however, the proximity to the galley may be bothersome. 82 D None No Power Seat 82 D is an Economy Class seat with extra legroom. Passengers traveling with an infant are often seated here as there are bassinets in this row. 82 E None No Power Seat 82 E is an Economy Class seat with extra legroom. Passengers traveling with an infant are often seated here as there are bassinets in this row. 82 F None No Power Seat 82 F is an Economy Class seat with extra legroom. Passengers traveling with an infant are often seated here as there are bassinets in this row. 82 G None No Power Seat 82 G is an Economy Class seat with extra legroom. Passengers traveling with an infant are often seated here as there are bassinets in this row. 87 C None No Power Seat 87 C is a standard Economy seat, however, the proximity to the lavatories may be bothersome. 87 H None No Power Seat 87 H is a standard Economy seat, however, the proximity to the lavatories may be bothersome. 88 A None No Power Seat 88 A has limited recline. The proximity to the lavatories may be bothersome. 88 B None No Power Seat 88 B has limited recline. The proximity to the lavatories may be bothersome. 88 C None No Power Seat 88 C has limited recline. The proximity to the lavatories may be bothersome. 88 H None No Power Seat 88 H has limited recline. The proximity to the lavatories may be bothersome. 88 J None No Power Seat 88 J has limited recline. The proximity to the lavatories may be bothersome. 88 K None No Power Seat 88 K has limited recline. The proximity to the lavatories may be bothersome. Complimentary food and bar service are available on all Emirates flights. Emirates was the second airline to operate the Airbus A380-800 aircraft. Emirates operates three versions of the A380 with slightly different configurations. This version has fewer Economy Class seats. To verify the correct version of the A380 at the time of booking or at online check-in, the follow rows may be used as reference: Economy begins at row 43 on the main deck; Business Class ends at row 26 on the upper deck. My son and I just flew round trip between JFK and Dubai, both times in 23E and F, and we were extremely happy with these seats. They are in the smaller rear business class section, which is both quieter and nearer the lavs so less of a hike. At the same time, they are in the front of this cabin, so noise from the bar does not really carry. This row also has the storage areas towards the aisle, so there is no bother from flight attendants or passengers in the front business section passing through on their way to the bar or lavs. I especially recommend these seats for a pair traveling together, but the privacy screen between E and F is high enough that I personally wouldn't be bothered as a single either if A and K seats were not available. I have chosen to sit in 65D now 3 times. I like having close access to the toilet which is not bothersome. Chair still has a good incline, is a disabled seat so arm rest goes up. Temperature/noise comfortable enough to sleep. Im 5ft 7, size UK22, this is one of the most comfortable economy seats I have tried so far. On the A380, for my family of 4 this is the 'best' most comfortable seats available with great pitch, entertainment and then food (in that order). 3 of us over 6ft so ideal seats. Everything worked as it should from the seats. Good seat overall. The screen worked fine, though the headphone jack was a bit fiddly. This seat is nice for long flights as it is just far enough from the toilets that you can stretch your legs a bit. Great amount of room for a 5'7 woman of medium build. Nothing too fancy, but was comfortable enough to get me a little bit of sleep between London and Dubai. The trip was from Brisbane Australia to Dubai in a nutshell A380 Economy seats are the best. On EK9 Dubai to Gatwick. Not convinced about the seating style, you feel cramped due to excess stuff, but the service and food is fabulous. Has a very nice view of the engines while still being able to see what's on the ground. The noise from the engines could become quite bothersome. The seat is quite close to the galley which didn't bother me particularly but it could bother some people. People travelling with babies are usually seated next to 53C because the cribs can be used. This means you are seated next to crying babies. Also the serving area is just in front so if the curtain is not closed properly you will get the light in your eyes most of the flight. Standard seat with good recline, fairly comfortable and reasonable space surrounding. This row is a little bit decentered from the others in front (just a couple of centimeters). This means that every time a flight attendant pass in the corridor, it may hit the seat. Emirates charge extra to pre-book seats, don't bother as the bulk head seats etc are not avaiable for pre-booking and allocated on need so you might score one. Our seats were one of the worst ever - adjacent to galley, behind parents with noisy kids, subject to heavy passing traffic. I sat in this seat for 14 hours from Sydney to Dubai. I paid extra for it (about $150 US dollars more). The pros: The legroom is great. We were able to bring out bags down from the overhead (after takeoff) and setup a little campsite in the space. Its nice to be able to standup and stretch and walk around whenever you feel like it. Despite what others said, we didnt notice the cold at all. The cons: Its true what they say, the galley is LOUD. It doubles as a staff room so I frequently had off-duty crew standing at my feet chatting to the staff inside. This got annoying after a while and I had to ask them to move inside so I could try and sleep But you cant sleep. From the noise, to the people constantly bumping you. This will drive you mad by the 9th hour (why people? WHY? Can you not see me??!!). Hint: I finally figured out if you raise your TV it acts as a barrier  so your blind and clumsy co-passengers will hit that instead of you and you can keep sleeping. My wife in 80B didn't have this problem and her sleep was better than mine. Your overhead light is always on because of the galley. So when the rest of the plane is bathed in soothing darkness for sleep, you get the glaring lamp above you 24/7. The narrow seat is a little uncomfortable. Im an average size guy but I got a case of bum-cramp by the end of the 14 hours because I couldnt shift my position enough. VERDICT: The cons even out the pros in my opinion, so dont pay more for this seat. The worst part for me was that flight was only 1/3 full, so I got to look at every other aisle with passengers spread out on 3 seats, sleeping in the quiet dark while I returned to by fluro-lit position next to the gossiping staffroom. Its only worth the money if you know the flight is going to be full or if you're not planning to sleep, otherwise Id take my chances in another seat. I agree with prior comments about the business class seats being quite comfortable and am only adding some comments about this seat (21A) and (21J) being for travel with an infant. These 2 seats are bassinet seats and I traveled in both with my 8 month old daughter recently. The bassinet is attached to the panel next to the video screen (which is essentially the back of the seat in front of you). The bassinet then sits above all the seats so your baby is quite close to the overhead bin. You have to strap your baby in, else it's quite dangerous as they could roll out and fall several feet onto the floor. The other challenge is that because the baby is so high-up, they're quite close to the lights. My little girl didn't end up sleeping in her bassinet because it was too light - but it did keep her entertained for a bit as she laid there playing with her toys and looking at the lights. So if you want to use a bassinet for sleeping, I'd recommend considering one of the bulkhead bassinet seats first. There is one plus about these seats and that's that there is space behind seats 21D&G (center aisle) and the bulkhead so if you need to stand-up and bounce your baby, there's a convenient spot to stand that doesn't get in the way of other passengers moving around the aisles. The other option is to go to the bar area which also works well as a change of scenery and room to walk around. @Admin - I'm not sure how traveler photos are submitted but I have a photo that shows how the bassinet looks in relation to the seat. Please let me know if there's a way to submit it. Thank you. The seat was within hearing distance of the kitchen where one of the staff was roughly handling cutlery. However the noise cancelling headsets was fantastic. Extra leg room is good but be warned, this seat and adjoining 67J is considerably narrower than the standard economy seating making them very uncomfortable and in my opinion not worth the trade-off of extra leg room. Rigid side panels on the chairs may contribute to this problem. Having flown business class before which is superb on Emirates I find it soul destroying to fly economy for any length of time. The 7 hours drove me crazy and I'm due to go back to NZ 17 hours in same seat!! Emirates now make you pay extra for better seats on aircraft, although there is no reason to pay for seats in front section as they are no different to others. This seat was OK for me as could get out when I wanted but no good for sleeping, you need a window seat for that. Entertainment system was my saving grace! I was booked in standard seat 44H but 45D & E were empty so after getting the nod off the crew I skipped over there after the seatbelt light went off. All the big blokes sat arounf just looked at me :) Anyway a couple of points - it initially appears that this seat has no power sockets, but in fact they are kinda hidden below the seat cushion. Another reviewer here has said seat 68A has no power, but again it does, it's under the seat (I expect all the extra legroom seats are the same). The best bit about 45D is it has about 20 feet of legroom. Literally. There may occasionally be a bit of traffic coming past you to the forward toilets, but not enough to offset the legroom. AN of course there is a bassinet in front of you to the right. Fortunately there wasn't a peep out of the baby in mine over the 10 hr flight. This is a dreadful seat i had my feet trodden on by staff, i had a food trolly alongside me with a male member of staff with his bottom at my face level for W hours preparing and loading meals, items of food kept dropping off trays onto me. The seat clearance in the aisle is too narrow so staff and fellow passengers keep knocking your TV. The final insult is i paid and prebooked aisle 42 at the front and was moved without notification to these dreadful seats. First journey with Emirates flew out on row 44 and very pleased. A very angry and frustrated passenger that had the end of my holiday ruined. I was able to sleep 7.5hrs straight...! Not advised for those travelling with infants even though it is a bassinet seat. Once bassinet in place cannot use entertainment system in seats a or b. If you need to leave the row (for toilet etc) you will need to dismantle bassinet. This is not the case in othet bassinet seats on the same aircraft. We asked to move as situation not suitable for an 11hour flight with a 5month old baby. Flight was Auckland to Brisbane 31/12/17. Was fortunate to be upgraded to Business Class. Seat 9A was beyond comfortable - it was like being in a lazy-boy chair... I extended the seat to the lie flat position while watching a movie and enjoying drink from seat minibar. Meal was delicious. Service awesome! Take off & landing very smooth. Definately my airline of choice! Flight was Brisbane to Auckland 24/12/17. Great seat - economy class on Emirates A380 is like travelling business class on any other airline. Seat was spacious, ample leg room for me (5ft 7in), old style pillow, blanket etc provided. I found this seat to be excellent. I was never bothered by the proximity to the toilet at all. When people were waiting they were never near my seat it was always in the space between the two sections. You could also fully recline without worrying you were bothering people behind you and because you had the aisle you get up whenever you wanted. I would not hesitate to choose this seat again. It is amazing because it has remote control tv's and anazing service, so I give a 10/10. The main problem with this seat is that people stand behind it. It would be ok if they were just stretchibg their legs but when they bring crying babies or carry on loud conversations while lights are out - rude and annoying! Great seat for a daytime flight as the seat is the front row of economy and has better legroom and the advantage of nobody in front reclining their seat. It's easy to get out of the seat to visit the lavatories which are close. At night the proximity of the small purser's office would be a distraction though. 44 C is a seat next to the stair to the upperdeck. Under the stair, next to this seat is an office from the headpurser, who has to enter this during the whole flight, also at night. That means light outside in your face and a noisy slide to open and close the door. I would not recommand this seat. The flight was great and so was the staff. comfortable and relaxing suite with inclosing doors, but still very spacious. services and food was amazing, and the facilities on board the aircraft were breath taking. I had this seat on the A380 all the way from Gatwick to Auckland. Its a great seat, has a bulkhead right in front, and so makes you feel like you are in your own private cabin all the way. The seat reclines to horizontal and is comfortable to sleep in, although on a 16 hour flight, pyjamas would have been great (like Virgin Upper). Food was very good, the bar was excellent. The entertainment system was confusing and not as easy to use as others. Wifi all the way to Auckland for $1US was superb - I could annoy my friends with Facebook updates all the way!! All in all, a very good product. Prefer down the back myself, never understand the pack mentality to get off first, just to wait for customs and luggage. On this version of the 380 there is a crew cabin wall at the side of your seat, but it doesn't feel claustrophobic at all. For cattle class this is OK, and even when the person in front reclined, it was not a problem. No noticeable increase in engine noise down the back, and you get to board first. I travelled from Auckland to Melbourne (3.5 hours) but would have gladly continued all the way to Europe in this seat. I am 6'6" (200cm) but had great leg room and seat width was very good. Entertainment system was great, plane was very quiet and smooth, crew was excellent, food was so much better than other airlines serve up. One of the best flights I've ever had. terrible seats. poor width. totally cramped. got a sore neck. I had seat 63G, plenty of leg room for my 7 hour fkight. Was toeards the end of the cabin so newr enough to the toilets, but far enough so you didnt get disturbed during the flight. Sinc eit was an aisle seat, did get bumbed by the cabin crew's cart occasionally. However, i really recommened 63G. Was a perfect flight and seat for me. The plan is very misleading as are the comments. Read the sizes. 48 inch pitch, what? this is really 8 across seating not 4 across , stepping over legs and the narrowest so most uncomfortable business class seat in the sky. Dont be conned. read the seat comparison page on this website. Avoid absolutely. The back of the plane is a undecribable experience it feels so nice and comfortable. Seats are terrible for a baby due to the bright light from the TV screen above. This area of the cabin doesn't dim as much as the rear cabin which makes it difficult to sleep. In addition the seat 45G is in the aisle which means you don't have full use of the front of both seats and you are constantly being bumped when trying to sleep. I would never book these seats again. 7K is the first seat - on the right side of the plane in Business. Apparently the best seat in this can class. What one must know about this seat. It is an open plan seat. If you don't like passengers wearing into your private space then gor for something else. As there is no seat in front of you the backing of the front seat is missing. The Screen unit is storage for menu cards so the cabin crew are fidgeting behind the screen quite often. BUT in saying all this i believe its the only seat with the least passing traffic so definitely a great seat if you want to rest. This seat might possibly be the best on the plane! I was traveling from Sydney to Dubai in this A380, and immediately knew 24A was the seat I wanted. It looked as if the rear business class cabin was way quieter, and that was true, since it is about a third the size of the front one, and people who like quiet seats usually sit here. The food was great and very well decorated, and the 15' tv screen was one of the best I have seen, with a variety of movies, that most other airlines don't have. The staff were very nice, and this beat coming to Sydney in Quantas. The only time it was loud was after the lights were dimmed and some people were getting up to go to the bar. Reccomended! I have travelled with ek many times solo and with my wife. When travelling with my wife we have the "love seats " together which are fabulous. Travelling solo in business can be tricky. I always receive a seats a b or j k on their own at the side of the cabin. Beware as the a seat is on the window and private but the b seat is on the aisle and open to the aisle so can be noisy and you are looking directly at the passenger in the e seat. I had a disturbed sleep when the seat e aisle guys friend turned up for a chat loudly during lights out. Flight attendants often knock you when they walk past. b seat not as private. The seat 6D is horrible. Noisy and you have a feeling that u r in a store. They keep a box that contains blankets and other stuff in front of you and they keeo bothering u for opening it, let alone the light that is coming from service area in front of you. It was horrible expereince and waste of money. Restricted extra legroom due to emergency exit door protruding into left leg area. Also experiences cold coming from exit door, can be reduced with Emirate's provided blanket. Still better legroom than a non-exit row however I would recommend middle or aisle seat for this row if possible. Air con on flight was very strong. The flow of the air seem to be directed to this seat so it felt very very very cold. This is the only type airplane where I need a seatbelt extender.... It's really strange, dont need one on the other EK A380's. Awesome seat! The legroom is amazing - abour 12 cm more than I had on my next flight on an Emirates' 777. Although there is a wall behind, you can still recline the seat and the proximity to the galley wasn't bothersome at all. I travelled with my 5 children from Auckland to Sydney and i booked 1A, 1E, 2A, 3A and 2K and 3K and all my kids and I enjoyed our seats and the attention from staff and the services and loved the Bar. Love travelling with Emirates in First Class every time. The seat at 67C have extra legroom, but the infotainment system have to be stowed during takeoff and landing, and there's no seat pocket. Any small bags have to be put in the overhead compartment. 67 D-E-F-G aretreasured seats due to leg room, but people take a short cut to get to toilets, and with your legs stretched out, or even not stretched out,we were constantly kicked, stood on and knocked. Then the oldies taking this short cut hold onto your screen and either shut down your movie (touch screen) or bend it around as they put all the wight onto this screen. I would forgo the leg room next time. Perfect if a bassinet was there, but thats about all. I have flown overseas in Business Class on 8 different airlines. Emirates is by far the best. Big screen TV with wide selection of entertainment, excellent flight info, superb food and service, etc. Wish they flew to Europe - I would use them over anyone else. Overall, excelent and would fly with them agian!!!! Love emirates and the service was great!!!! Well done emirates for making my flight enjoyable! 4K is a little noisier than 4A but still imho a very good seat choice. Very constable seat. Very generous space for a big guy like me. I love flying the A380. I have travelled many times on the A380 with Emirates recently. Upper deck is superb. However on last flight I was in this seat and it is far inferior to any others i have been in. Cramped in comparison and very noisy as the cabin crew put away all mattresses and pillows etc 2 hours before landing. Have Flown Emirates Business to Bangkok a Number of times now Always a pleasant Expiereance. This seat provides extra leg room given its at the bulkhead. However being close to the emergency exit, the attendants usually gather near by. COMFORTABLE with Extra storage an added advantage to keep my ladies stuff. Extra legroom is bonus, however IFE screen is smaller, and cannot be used during take-off and landing, unlike the other seats. Passengers in 68B also see your seat as an escape route for bathroom breaks. We had seats 52H/J/K next to the galley, to say passengers may find the noise from the galley troublesome is a huge understatement! Firstly, the galley is brightly lit and lights shine directly on you, they don't use a curtain. Even if you block the light with mask you have the noise, lots of noise, if it's not the constant banging of the galley cupboard doors it's the cabin crew bitching and complaining about passengers, their boss, the airline, operating procedures, etc, etc... just horrible to listen to. Meals were low grade and poor quality plus. Meal service took for ever and was completely unorganized. Condensation from the galley freezers made the floor soaking wet in front of and below our seats - the crew explained this always happens and covered the area in blankets. ICE system is good, but the crappy headphones are a perfect example of form over function - who has square ears? EK385, was met at BKK airport with stairs on the tarmac about 20 minutes after landing, and free bus ride to the terminal (driven by a complete idiot) Even LCCs like AirAsia afford their passengers an air bridge to walk into the terminal. 52K is an awesome seat, you have tons of legroom, I could even stretch out (I'm 1,65m)! The galley wasn't really bothersome, but my flight also was only 6 hours long. By the way, there is now window missing in this row, because it's not an exit row. I can really recommend Emirates (especially this seat), my flight was great! Airbus A380 is a superb aircraft. 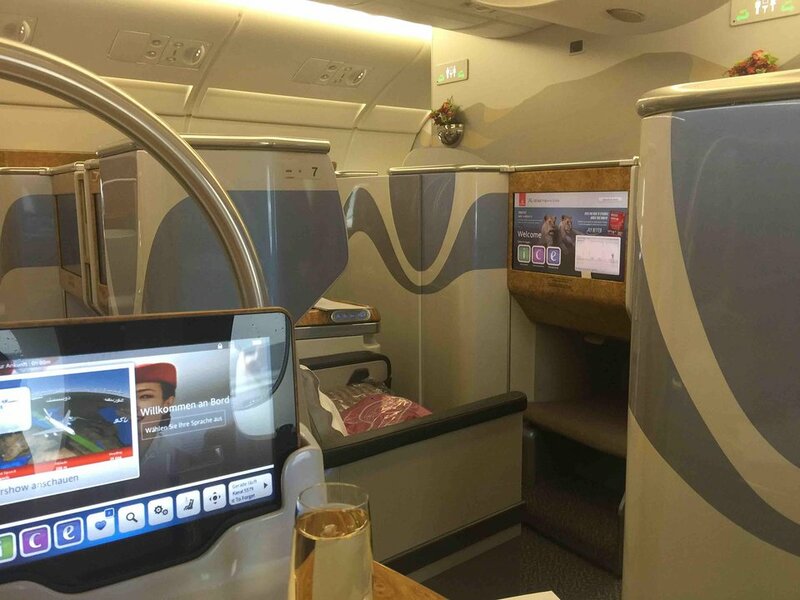 I normally travel Business but this experience in Emirates economy was outstanding. The aircraft was spacious, seat pitch and width was execllent (I'm 180 cm/200 lbs), no obstructions at the feet, very low noise level and ample toilets so no queues. Beats all other Economy cabins hands down. The best ever busness class seat IHave ever had. Comfort level slightly above business... location is atrocious with constant noise from the kitchen and bathroom. 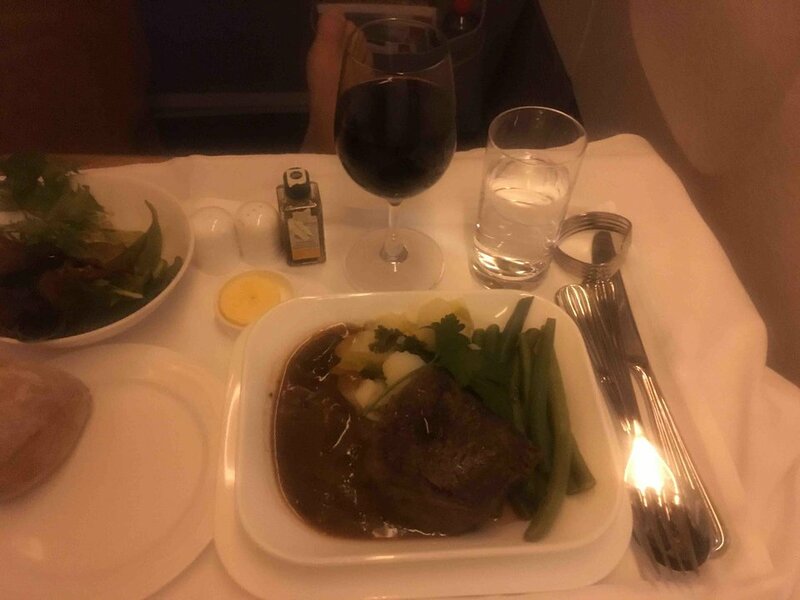 First class service is on par with SG or AF business in a sort of Ryanair way. Narrowest 1st class seats in the air!! Fantastic seat fantastic service I am a very wide guy and these seats are more than ample, loads of leg room, great sleeping. Huge range of entertainment, great food and drinks when ever you wish fo some, fly London to Dubai to Auckland whole 29 hour flight went by very quickly and arrived in NZ fresh as a daisy, london loubge excellent Dubai lounge too hot and stuffy and crowded. second time trip in Business class and could not ask for anything else. I flew Emirates MEL-SGP-DBX today and found that the 2 lockers immediately in front of 7K means you can often be disturbed in the night while the crew get things out or stow them away. We were duped into thinking we would have seats in Row 43 with plenty of leg room but the seating plan displayed for check in was not the correct one for the actual aircraft so we ended up sitting two rows back. There was no space in the overhead lockers so we had to put our carry on bags under the seat in front which reduced our legroom. When are airlines going to get serious about the size and amount of carry on luggage? Seats are generously wide and plenty of legroom to stretch out. I am 90Kgs and 5ft 10" and no problem for me.There certainly was more room to get past the other passengers on the same row compared to other airlines I have travelled on. The A380 is a very quiet aircraft but being in front of the engine made it even quieter! Service in the front cabin area was very good and very quick as it is only a small area. Also note, being in this section, you are last on and first off. Brilliant Plane. Much the nicest in the sky at economy level. Great aircraft A380 from Dubai to Madrid - a lot more legspace than their B777's. Entertainment system also top notch!! Older / original A380. 9 E Seat didn't recline work. Tried to get it fixed in Sydney but ended up having to move for SYD-DXB. Service was good and the seats are very comfortable to sleep in. Even outside (B,D,G,J) seem OK but the A,EF,K are better and feel more private. Bar at back of plane is great. Only Business class toilets are at rear of plane so longish walk from row 9! Proximity to the galley was very irritating because the area around the seat is used to put carts as they are prepping for service. Other passengers constantly bump the screen and drinks/food on the tray table. The leg room is nice, but having to store screens away and the above comments makes this seat a no go zone for me in the future. Also no window, but that's a benefit for napping. 67H has an immovable arm-rest slightly reducing the width of the seat, and you can't use the screen during taxi, take-off and landing (which means missing out on the cockpit camera view). Also due to the emergency exit, there is no window. 67J has an immovable arm-rest slightly reducing the width of the seat, and you can't use the screen during taxi, take-off and landing (which means missing out on the cockpit camera view). Night flight, very good sleep, extremely comfortable and the best seevice you can imagine. Congratulations. Awesome business class seat, only a 3.5 hour flight but great comfort and very relaxing. On 04/17/16 I flew Business class in seat 14E. I really like this location and layout of the seat having the mini bar to my left. Very comfortable, the seat was in great clean shape, very nice privacy and the crew were amazing. It is nice to be able to get up and use the lounge in the back, sit and chat with other passengers. It made a 16h 40m flight go by fast. I cold not have asked for better service. There is also plenty of room to walk around freely to loosen up the legs. In this seat,the table could not be used,as there was insufficient space between the table and the seat cushion.Anybody less than 140lbs would be OK.I was offered another seat but declined and ate "side saddle" using the drinks shelf.It may not suit others to be without a table on a 14hr flight.How did this slip by the quality control dept.? Flew on the A380 MEL-AKL return. This seat 45G has loads of legroom as the bulkhead does not extend all the way in front of the D and G seats in row 45. However, the tv screen is in the right arm rest, on the aisle, and every time a trolley went by it without fail knocked the tv screen over, usually into my shin bone. A couple crew were apologetic but most didn't notice or care. Emirates has some of the worst economy food I have eaten in the air! It tastes like chemicals. Completely unpalatable. My advice is bring your own snacks in economy! Contrasting the food, the wine selection is decent. Thus was the worst seat i have sat in on any airline! Right next to the loo. Seat was reserved for me by The Flight Centre 6 months earlier. It was my first experience of Emirates which i had been led to believe were to notch. It was very chilly most of the flight - when asked for anither blanket the steward said theyd all been given out ! Proximity to galley made sleep impossible due to activity and noise, specifically a VERY annoying intermittent tone generated by on board [galley?] equipment. Not a nightmare as I could not get ANY sleep! It has the best leg room in all the planes i have ever traveled, the best plane so far i can say. For such a large aircraft , i was thrown about in the seat with severe turbulence practicall all the way from Melbourne to Dubai. Hard to sleep, cabin crew constantly noisy, and carrying out first aid behind this seat to passengers who were unwell. Avod this seat if you want a smooth ride and a decent sleep ! There is Bassinet storage in the overhead bin for 46D/47D (and I think 46G/47G as well) which reduces the space available - only one full size cabin bag can fit in, plus small bags or squashables. Great seat. Nobody in front and full recline. In fact there were only 6 people in the entire cabin from DXB to KUL. During overnight flights a curtain is meant to be drawn to prevent light from the galley disturbing the sleeping passengers. This requires the cabin crew to secure both sides of the curtain to the walls, by means of poppers, leaving a central flap for people to pass through. The flight on 20 Dec 2015 saw only one set of poppers secured and so every time that anyone (crew or passengers) went through the curtain, I would have to shut the curtain myself until I secured the other set of poppers. Conclusion = having either of these seats could leave you curtain closing duty. On notifying the senior steward of the problem, she was very helpful and concerned that I had had a disturbed sleep due to carelessness by her team. The other problem with these seats will come from the curtain endlessly being knocked against your legs every time that anyone goes through the curtain - not good for sleeping. Avoid these seats at all costs, if you are on a night flight. Although the seats offer slightly more legroom, they are far too close to the galley. The curtain did not block the light from the galley and cabin crew congregated in the galley, talking loudly throughout the 8-hour flight. The light, noise and interruptions by other passengers, seeking refreshments, meant that sleep was impossible. We were on 82 A, B and C, travelling with our 2 year old. The seat pitch and leg room are good. We traveled in June 2016. I requested for kids' earphones for my son and had to remind the attendant3 times to get those. Did not get the kids blanket after repeated reminders. So finally gave up. The in-flight entertainment is great with huge collection for international travelers. Food and seats are good. This seat is amazing. Great privacy and comfort. Emirates attention to detail for this flight was flawless, with the exception of one air hostess who wasn't the friendliest. The seat, while a flat bed, actually has a shelf for feet to be placed which is great for when sitting up. The seat then meets the shelf when lying flat, to make up the full bed. There is a significant amount of storage in this cubicle both under the window ledges and in the shelf under the screen. The TV screen is quite large and there is a mini bar of water and soft drinks on the left side of the seat. The noise cancelling headphones and mattress for giving an extra layer of comfort while sleeping are really nice touches. However, the addition of a duvet, rather than blanket, would have finished off the near-perfect experience. 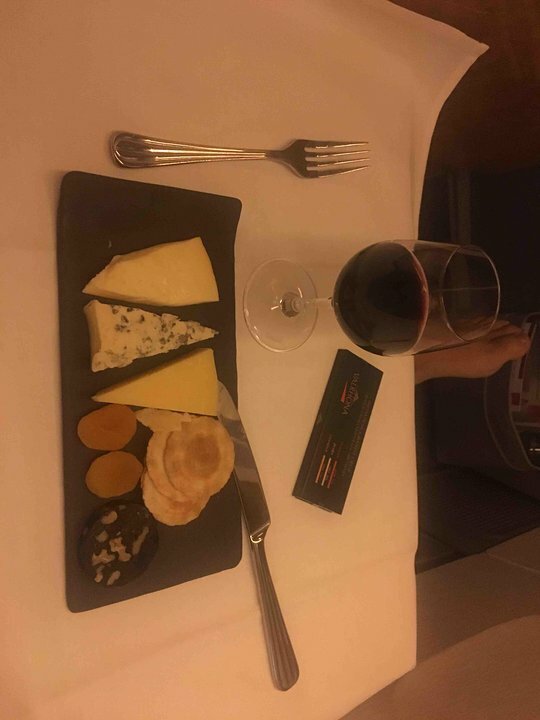 Emirates are always top class, both in economy and business, but this experience on this flight was a great incentive to stay business class going forward. Thanks to all involved. I was flying at night from BKK to DXB on this seat 51G on the 23 November 2015. I have two bad experiences about this seat: 1 First almost the complete Emirates cabin crew was holding meeting in het footpath behind the seat and next to the door. They were speaking loudy while all the passengers looked like they wanted to sleep. 2 Second, the chair has complete reclination because behind the chair is a footpath behind the chair and between chair and wall. However, the Emirates used the footpath behind the chair and next to the door to arrange all food carriages (about 10) for i guess the complete lower economy deck. They were actually not arranging the food carriages in the half closed galley, but outside the galley just behind my back. The arranging of the food carriages took a few hours with loud noise and attendants walking behind me while everybody wanted to sleep. Never choose this seas! There was a fair amount of noise from the bar area. Because this seat is slightly offset towards the aisle (as are other seats) it is prone to being knocked by passing traffic. As a general observation (as a frequent business traveller on multiple airlines) I feel that Emirates tends to be over-rated. First time with Emirates Sept/Oct 2015 CDG to DXB and return journey. Everything was excellent on both flights. The seats were very comfortable, spacious, ample leg room and for couple travelling together were perfect. No complaints whatsoever. A normal seat with a decent pitch, not to close to the wc and with less foot traffic that in the front of the plane. This seat occasionally gets bumped in by service carts, other passengers are less an issue. The leg room is unlimited, the small "office" below the stairs and the lavatory (behind a curtain) nothing to seriously worry about. An issue could occure if there was a bassinet with a crying infant in the same row which was not present in our case. Anyways, center row 45 probably has the biggest leg room in economy in the industry. However, the many advert anouncement by Emirates can be a bit annoying. The toilets arent bothersome at all as they arent that close to the seats. There's a lot of space for an economy seat for such a long flight from Dubai to Auckland. I am 6 foot 2 and there was enough room to put the seat back and stretch out underneath the seat in front. I have flown with the above several times already and am thoroughly enchanted by the carrier, the service and the flight attendants! seat 9K is an excellent seat with a perfect wing view of the wing tip & enhanced privacy. Whilst seats 52J and 52K have a bassinet for travelling with an infant, you cant actually use the entertainment system on either when the bassinet is in place, which is the vast majority of the flight. So if you're travelling with a baby, you can expect a looooooong haul with no movies or tv to keep you entertained. Of course, you'll likely have your hands full with the bub anyway! We flew Emirates and it was the best thing that ever could happen on the area of airplanes. Seats were big and comfortable. I recommend this plane very much! You need to be aware that seat rows 25 and 26 are right next to the bar, which means that if you have fellow travellers who are intent on guzzling as much free alcohol as they can get their hands on, this may lead to loud raucous behaviour, making your flight very unpleasant. We flew from LGW to Dubai fantastic seats with good leg room.My husband is 6'4" and quite large and he was very comfortable.We also had a window to look out of. Being near the front of the plane we got served our food first, drinks etc. If flying again I would have no problem choosing these seats. The 20 hr flight from Auckland to Dubai in seat 66H was the worst of my life. It's not clear from the diagram, but the toilet door is on the aisle, directly across from 66H. "Proximity to the toilets may prove bothersome" is an understatement. I even had one person slip and fall on top of me while leaning on the back of my seat waiting for the toilet. Added to this, these 3 seats have a wall directly behind, so there is no recline. I tried to change seats at Melbourne but the flight was fully booked, so I had to endure a further 16 hours to Dubai. AVOID THIS SEAT AT ALL COSTS. The same applies to V2 of this airline. Seat 43H on my return flight was blissful in comparison. Flew LHR-DXB on EK008 in late April 2015. Seat 50C. Excellent seat, excellent IFE, excellent service. The proximity to the galley was not bothersome, though perhaps it might be on a night flight (EK008 departed LHR at 0905). I would always choose the front cabin, whenever possible. The other 3 cabins felt stuffier and more cramped. Great seating. Plenty of leg room, had family/baby seat in front of me but this wasn't a problem. Great views from window. First time on A380 so very impressed. Have just returned from Dubai to London. The seat was comfortable with good legroom, the staff were attentive and helpful. This was an economy seat so I didn't expect the earth and after no frills airlines in Europe it was luxury. Emirates are a good airline it's a pity they have Dubai as their hub. If ever an airport was style over substance then this is it. Glitzy marble and all that but being bussed(! )to the terminal from an A380 is crazy. Less fountains and more information staff would be a start. Hateful place. Extra legroom for these seats but colder being beside emergency exit door, easily remedied by wearing socks and using blanket provided. Being beside galley made the fourteen hour flight experience noisy as staff were constantly coming and going (also some passengers). Curtain for galley was only drawn towards end of flight so the light constantly shone out for anyone who preferred it darker to sleep. Had my toes stepped on a couple of times but only by people trying to squeeze by the food trolleys sitting outside the galley at times. If you've any problems with your knees then these pod type seats are hopeless. I was unable to sleep on a 16 hour flight as I couldn't stretch my right leg to a comfortable position. On top of that, the space between the back of the seat in front ans your table isn't wide enough for a normal person to enter. If it hadn't been for the amazing standard of service, helpfulness of the staff and the bar, I'd have complained bitterly. Terrible service, actually all the way from Oslo to Bangkok. Tried Emirates (Business) for the first time and extremely dissapointed. Complained to Emirates after a horrible return trip as well. The answer was crap, big time. Just completed a 14 hour journey from Sydney to Dubai. It was an absolute nightmare. Although the seat I had is shown as good on the seat plan - and in many respects it was good - what is not highlighted is that this is where the small children and their parents are seated and god help you if the kids scream and cry throughout the journey as happned to us. Even listening to Jimi Hendrix at full volume didn't block the noise out. Beware! Seat is great due to window position and in conjunction with using the route map and on-board cameras it was my idea of heaven. Agree that economy's front cabin is the best-very quiet. Food was exceptional. While legroom was good, the fact that the aisle widens forward of this row means that people perceive it as a bend and 'cut the corner'. Everyone who passed the seat (including the trolley) bumped me. This is even worse when the screen is deployed (it comes out of the left seat frame and is a further obstacle). It is such a design flaw that this and 45G should be removed. 7K suffers from the same problem as 6D and E with noise from the toilets and also from the first class galley which can be VERY noisy as it was on my flight. Absolute luxury . Emirates lounge in Brisbane is fantastic . Every single staff member that passed me on that plane knew my name . even the bartender down the back. My own mini bar. excellent food and drinks at my leisure. Only fault with this seat , if you like looking out the window you wont be able to as the seat is an aisle seat and your bar and essentials block the window. Other than that , excellence. This has got to be the worst seat on an A380 plane It is on a restricted isle due to the staff sleeping quarters taking up a large block in the centre seating area and the access door opens opposite the seat. Staff come and go all through the 14 hour flight opening and closing a sticking door allowing light to enter the main cabin. Awful!!! One should avoid this seat - the gain in extra legroom is minimal and the proximity to the galley makes it awful. Also people going back and forth all the time. Very close to the bar area and kept getting woken up by two particularly loud gentlemen, even with the noise-cancelling headphones. Much prefer row 20, often select 20A which unfortunately was not available on my last trip. yes, this seat is too noisy due the loud discussions of the stewardesses as well as the continuous opening/close noise of the cupboards. This seat is awful. You are right by the bar and on an evening flight this means you cannot sleep. Whilst it is a wonderful to have a bar, its not so great for those people sitting just outside of it with a curtain separating them. I can't fault Emirates service, it was very good. For a tall person, this seat (I guess all seats except the exit rows) is horrible! Fortunately, the passenger in front of me was tall too, and he agreed not to put down his backrest, so it was acceptable. Flight from Dubai to Bangkok was nice. The seatcomfort in businessclass was ok, but not exceptionel. The length in the sleepingposition is good, also for taller persons as I am with 190cm, but it is to narrow. The meals are ok, the cabinstaff ok, but seemed to be trainees. If you are a couple the seats you need are E&F as they are the only seats next to each other. They are comfortable although a little close to the seats in front,your legs actually tuck in under the seats. Had a really good sleep on the flight out. Everything is close to hand, perhaps a little too close. Entertainment screen is a touch screen, much better than those dreadful 'remotes' on the end of cable. Huge selection of films but nothing I liked or had heard of. Food was ok, on the return breakfast was no better than a charter flight. and service was poor-had to ask for a drink refill 3 times before I got one. I'd heard so much about Emirates and was expecting a great flight experience but was disappointed. I won't rush to fly with them again. The flight I took from AUCKLAND - SYDNEY was the best day of my young life. As I am only still a young child, the first class suite was truly an amazing experience. I am so glad I was one of the few children ever to fly on an Emirates A380 first class suite. I am so so happy and so so grateful to all the flight attendants that occupied your every need. A quick overview: -Comfort 10/10 -Interior Design 10/10 -Shower 10/10 -Duration 0/10. I wish my flight lasted for a month -Entertainment 10/10 -Food 10/10 Overall, this was the best flight and day of my life! The business class seats seem narrow and quite enclosed so I often bumped my elbows against the armrest. The seats were private but the bed was rigid and not very comfortable. Service was pleasant. Nicely private window seat, I did find these capsules to be a little narrow and the warm mini-bar and ipad type TV controller were gimmicks, but nice ones. 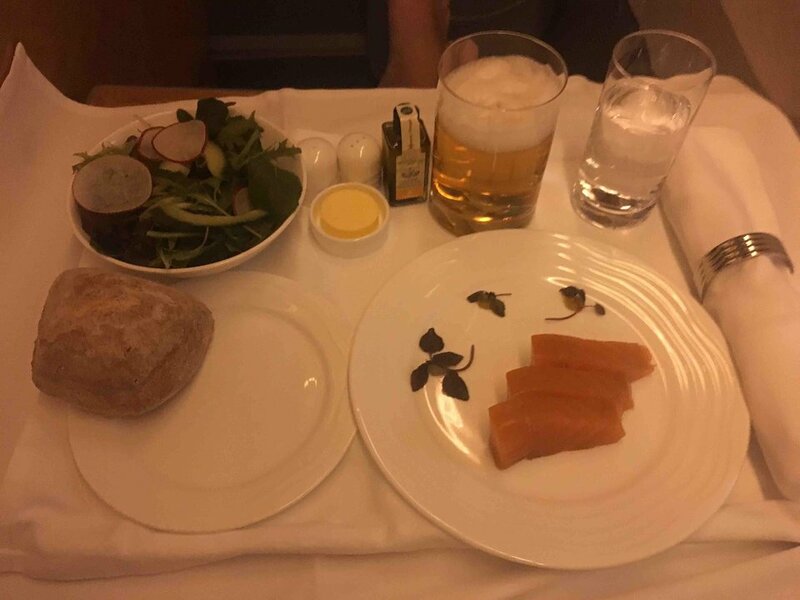 Was served food and drinks sooner than most as was near to the front, which was good as service can be slow for so many business class seats on one flight. The only issue was the distance to the toilets as all business passengers have to use those at the back of the plane, so although you can see from the green light if they are vacant, by the time you get there you may be waiting in a queue. Do ask for the mattresses that are provided to sleep on as they make the seat far more comfortable, even if you don't want to sleep. Standard seat with good window view. Bassinet row ahead and galley both proved mildly irritating. Meal service arrangements mean this is the last row to be served and for both main meals only one option remained available. Business seats are substandard for a relatively new plane. Seats are narrow, tray table small so food is served on a small tray - you end up knocking your food around and if you want a cup of tea you will most likely spill it. Can't get up without moving your food tray and pushing the tray table back in. Business class was literally empty with just a handful of passengers so maybe the word is out that its not worth it. Have flown business on American, British Airways and Royal Jordanian - i wanted to try Emirates and suffice to say i am very disappointed. Food on the three other airlines are much much better and the service much more professional and efficient. Seems Emirates hire hosts and hostesses but don't train them as well. The lounge is nothing to write home about - located all the way at the end close to the lavatories, it has unwrapped and uncovered food set outside - pastries uncovered may not be as bad as slider sandwiches with meat and piled on top of each other unwrapped and uncovered - not very appetizing. This was a major disappointment - am going back to my other airlines - older planes sometimes but service in business class and seat comfort is way better. Excellent leg room, however this area of the cabin was very cold. Large jumper and blankets necessary. Significant rise in temperature felt on going forward through the next cabin to yhe toilets. The extra leg room is excellent, however at peak toilet use times other passengers were constantly stepping over our legs in order to cross from one aisle to the other to access a free toilet. Best first class seat. I enjoyed everything in the mini suite. The ICE entertainment, world class dinning, showers, chair bed, amenities, mini bar and more. The seat is so comfortable can really relax. The food is so unbelievably delicious. And of course I had to experience the bar. Emirates is one of my favorite airlines. The entertainment has everything I want. Food was delicious, my second favorite airline meal I've ever had. Cheese Omelette. The seat was so comfortable I can fall asleep easily. The best service ever. The crew are so kind and friendly. I like the uniforms as well. The magazine was great. A, E, F or K-seats are preferred in business class since they have more legroom and storage-space and are more private. E&F seats are especially good if you travel with a companion, A and K seats if you travel alone. The shoe bin under the footrest is usefull but not very easy to reach. The lavs start half way across this seat, so you can see up into the next section. However the toilet door can swing round and hit your feet if you have them extended and the pax lets it go, as children often did. Also other pax woud step on your feet to cut to stand by the corner of the lavs. I was lucky mine was a day flight. An evening one would have meant being awoken constantly. AVOID THIS SEAT!!! This is absolutely one of the worst seats on this airplane. It's right by the galley, and for the over 13 hour flight from Dubai to New York, it was a completely unpleasant experience. Couldn't sleep a wink; as the windows by the galley remained open all through the flight, staging area for meal service was constantly VERY noisy, lots of people congregating in the area, right behind the seats, and on and on.... . To make matters worse, I had selected my seat prior to the flight with my boarding pass already issued at the airport. Seat was changed to this horrible location at the point of embarkation. Emirates was absolutely unfair!!! Being warned on the seat map that the proximity to the galley may be bothersome before flight, in my eyes it could, be written as a standard seat because I experienced what could be a better experience because there's no one behind me, I didn't get told to put my seat back upright when eating as that happened to me on my two previous connections to Dubai. The seat are no good for long trips they lack adequate foam and after three hours flying pain and being unconfortable exeist. Very nice seat , beautiful samsung tv screen and perfect bed at night. Super service minded crew of 4 for the 14 seats in first class. Refreshing shower room with warm floor and space enough for mile high, However E and F seating is better for couples. The coffe bar in front on first class was a water fountain top of the stairs going down on my airplane. you have to walk all the way in other end of business class to get to the bar. In the cubicle that is a business class seat it is very cramped and almost claustrophobic, very difficult to see out the window, impossible to eat ones food, without hitting the right elbow on the cabinet.The seat is narrow and I would hate to have an overnight flight and try to sleep. Once the tray table has been extended, it is almost impossible to leave one's seat without removing all items, ie food etc, from the table onto one of the cabinets. The newer model 380 is slightly better. After asking at the check-in counter they changed my seat to 80J. If you want leg space and be able to get up any time you want, it's a great seat. I was only a little disappointed because I couldn't see anything (there is no window next to you, but an emergency exit). A great seat! Previously I would prefer a window seat, but now I think I like aisle seats more. There was no one sitting next to me so I could lay my feet on the seat next to me and I could get up any time to go to the bathroom or walk for a bit. When we booked we didn't realise these were basinet seats - the flight was full and when we arrived on board there was already a young couple with a toddler who evidently didn't expect anyone to arrive in the seat.The whole flight the child who must have been close on 2 years, was either screaming, throwing stuff around, kicking me or putting food all over me, plus the mother decided to change her nappy on the floor in front of the seat. The cabin staff said there was no room to move us nor attempted to help. On Singapore airlines on the A380 they have room on the top deck for pax without children! My seat was absolutely fab! Reclining seat , reasonable leg room, a television with everything you could wish to watch, big windows, and lovely cabin crew! Eventhough you were near the lavatory , you would never know you were there! Business class seats are only half an inch wider than economy seats, not wide enough to sleep. The lounge bar is a joke especially when it only fits about 8 people. 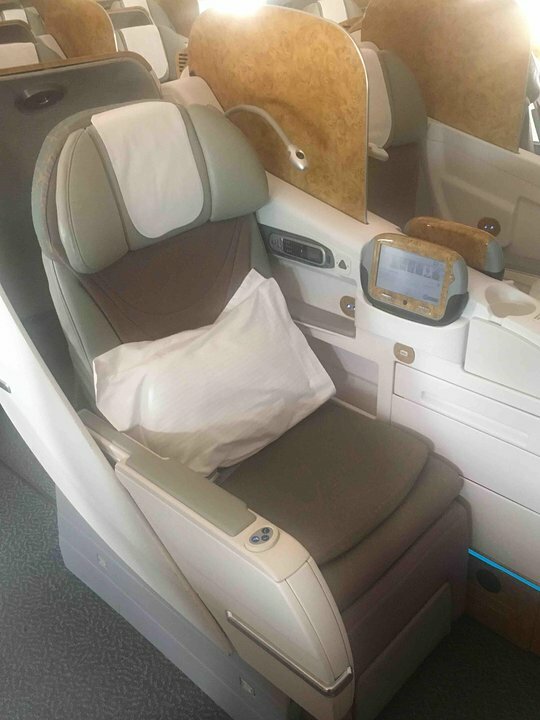 I fly business class for the comfort and the Emirates 380 does not deliver. One of the reason I now fly Qatar and Etihad. Great seat! I'm 6ft8 tall and I enjoyed my journey from AKL to DXB very much. There was much legroom due to the missing seat in row 67 just in front of me. Additionally, I had a window to lean onto. Excellent in every respect: huge seat with vibrators (to help reduce DVT?). Quiet. Fully enclosed cabin means privacy. Loads of storage space and wardrobe too. Bed and duvet was good enough for sleep. Full WiFi excellent and it has full internet access too. Cheap at $10/flight. The power shower in the front bathroom - wow - it is brilliant! I read a comment about this seat being noisy etc. I did not find the 'office' under the stairs a distraction and the extra leg space was definitely welcome. If given a choice, I will choose this seat again. In fact, the entire first section of the Economy class can be recommended. When booking, Emirates seat plan for this aircraft shows seats 66J and 66K as a two seat row without seat 66H. In fact seat 66H is available making this row a standard 3 seat row. It's very noisy in this section of the plane due to the bar and there is continual traffic up and down getting to the bar. If you don't want to sleep great but I'd choose a different seat if you want some rest. I had this seat on an overnight flight. Noise from galley was very noticeable all throughout the night. There is lighting just by the separating the galley from the cabin which is also disturbing. On a day flight these would not be an issue but beware overnight. I was in this seat and the entertainment equipment box was not bothering me at all. In fact, it was like the box was not there. The window was not really in a nice place, the seat has 2 windows but 1 window is almost at the seat in front of you, so you cannot really see through. The other window is exacly where your head is, so you have to sit cramped to see through. The armrests do not go up as per most legroom/bassinet seats. Worst, the crew have an office under the stairs and the entrance is next to this row. All flight there is clunking of the handle and bright light coming on when they go in and out...no effort to be quiet....kids wake up. Also proximity to flight deck with its magnetic rope across the entrance is another source of loud clunking during the flight. Also other passengers congregate around this front area for the toilets, to stretch their legs , peek up the stairs and to chat about their day-more noise!